Make the Mark In business, When you meet your client then the first impression is every thing. You talk with them, handshake with a confident smile and on the end time to set yourself apart even further. Hand them a business card something they will never forget a METAL BUSINESS CARD made of Stainless Steel, Brass or Copper. - With Foil, Spot UV and Embossing! Unique metal business cards with customised designs. Full color printing on metal cards. Impress your clients with this outstanding unique business cards. One side / Two side printing options available. Stainless Steel Business Card, Size: 3.5"x2"
the leading supplier of high quality metal business cards and custom metal products. 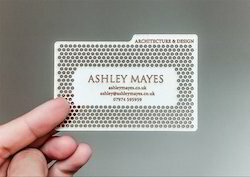 We believe that our metal business cards can make a huge impact on your business and personal life. 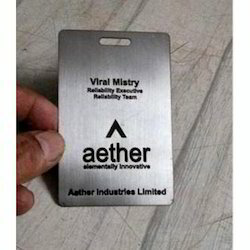 As per the necessities of the customers, we are involved in providing the top quality of Metal Visiting Card.